AUGUSTA -- With a new campus that can accommodate up to 1,000 students, Kaplan University is poised to play a major role in higher education in central Maine. AUGUSTA — With a new campus that can accommodate up to 1,000 students, Kaplan University is poised to play a major role in higher education in central Maine. The school celebrated the opening of a location in the Marketplace at Augusta, its third in Maine, on Wednesday morning with tours, a reception and remarks by Gov. Paul LePage. LePage, who also spoke at Kaplan’s commencement in June, praised the school for providing another choice for students and working with employers to meet workforce needs. Maine has great community colleges and universities, LePage added, but he said Kaplan offers schedules better for nontraditional students, including those raising children. 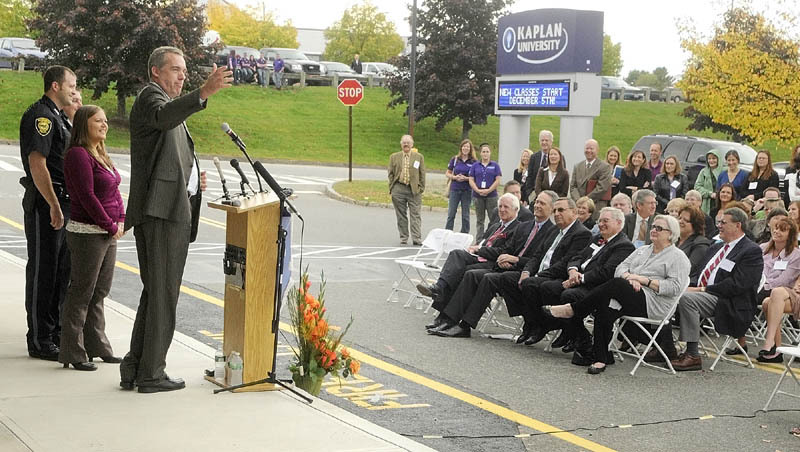 Kaplan University Maine President Christopher Quinn said the school’s expansion into Augusta will be good for Maine and that he appreciated the support of elected officials and business representatives who attended the ceremony. Kaplan has operated campuses in South Portland and Lewiston for several years. The 100 to 125 students enrolled at Augusta this term bring the school’s statewide enrollment to about 1,200. Quinn said the new campus is drawing students from a 30- to 40-mile radius around Augusta, and the demographic profile is similar to that of the other Maine locations: a large majority of students are women, and the average age is early 30s. Kaplan University is a for-profit school offering certificate through graduate programs in fields such as business administration, criminal justice, early childhood education, health care and paralegal studies. Quinn said the college is awaiting regulatory approval to add nursing and information technology courses at the Augusta campus, but laboratory space for those programs is already in place. Glynn Trask, branch manager for Kristie Rowell Insurance Services in Augusta, said she attended the ceremony on Wednesday because she’s had no experience with Kaplan or its graduates, as far as she knows. She said Kaplan’s accounting program could potentially be a source of employees for her firm. Trask said it is difficult to find workers with a solid business education. “A lot of places are adaptable, but there are more students than there is availability, so I think Kaplan will open up spaces to people who are on waiting lists,” she said. Kaplan is more expensive than public institutions that offer similar educational programs locally. The estimated cost of most associate degrees at the Maine campuses is $22,500, whereas Kennebec Valley Community College in Fairfield would charge $10,000 for a medical assisting degree and the University of Maine at Augusta would charge about $15,000 for an associate degree in business. Quinn said Kaplan will compete by offering small classes and being responsive to student needs. It was enough to win over 20-year-old Augusta resident Nikkole Schulte, who is studying medical assisting at Kaplan. “The staff is very friendly, very open, and they seem to want to help you succeed in every way, whereas the enrollment process at UMA was very confusing, and nobody really wanted to tell me anything,” Schulte said. Implementing one-stop, “concierge-style” student services is a priority at UMA this year, President Allyson Handley has said. Another medical assisting student, 18-year-old Adria Brann, of Randolph, considered attending KVCC but chose Kaplan based on the recommendation of an acquaintance, despite the higher tuition. Brann also was not dissuaded by a friend who warned her against attending a for-profit college. Kaplan University and its parent company, Kaplan Higher Education, are part of a growing and controversial sector of the higher education industry. A Senate committee report released in July leveled harsh criticism against Kaplan Higher Education and 29 other for-profit higher education companies, which receive most of their income from federal financial aid and represent a disproportionate share of students defaulting on loans. Schulte said she was not concerned about the cost of attending Kaplan because financial aid staff helped her put together a package of loans to pay the entire bill, and she’s confident she’ll get a job to pay them off. Quinn touted the Kaplan Commitment program, which began in January 2011 and offers students a full refund if they withdraw by the halfway point in their first term. Internal tracking shows positive results, he said, but the program’s effectiveness won’t be fully known until students have cycled through the length of a full degree program. A sharp drop in enrollment has followed the introduction of Kaplan Commitment. Kaplan University had 44,756 students in June, compared to 75,520 in June 2010.